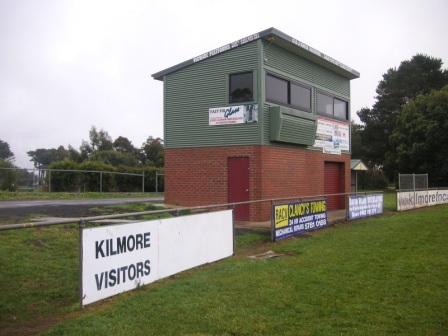 After our visit to Broadford, the Scoreboard Pressure father-son mid-week mid-July road-trip headed 20 kilometres south-west to Kilmore. 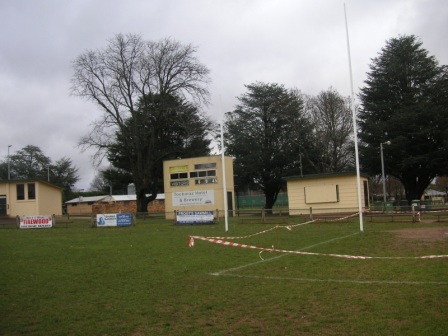 It being mid-week there wasn’t any action at J. J Clancy Reserve. The electronic scoreboard was locked securely away under a roller-door. The old manual scoreboard on the fence had had its hooks removed, so we couldn’t even see if our old Williamstown numbers would fit. 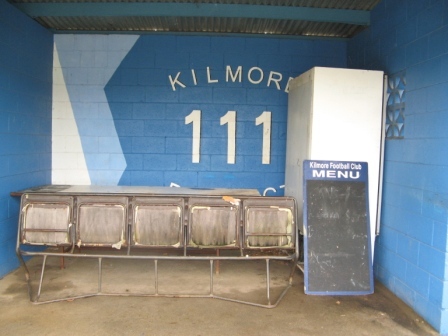 But there were two curiosities: a wall saying ‘Kilmore 111 District’ and a particularly patriotic advertising sign. 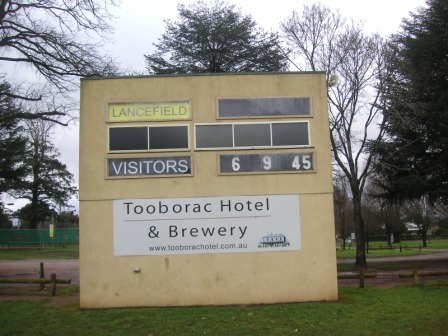 From Kilmore it was another 20 kilometre drive, west to Lancefield, home of the Tigers. The enclosed scoreboard there was showing the visitors score but not the home team’s efforts. The Tigers were formed in 1872 and, their website tells us, have won four senior footy premierships and an A grade netball flag since 1995. 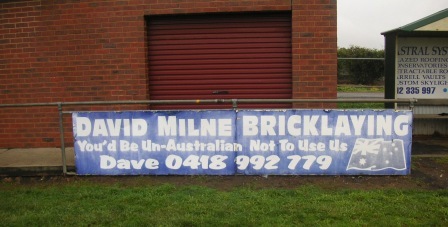 The website also has the lyrics from a club song seemingly written especially for the 1960 Grand Final against Sunbury. Kilmore and Lancefield (and our first stop, Broadford) all play in the Riddell Football League. The final destination of the road-trip is Romsey, home of the Redbacks. Stay tuned.